The Department of Licensing is looking to fill current and upcoming board vacancies on the Cosmetology, Barber, Manicuring and Esthetic Advisory Board. A currently practicing cosmetologist, barber, esthetician or manicurist? A representative of an approved apprentice shop? A representative of a privately-owned cosmetology school? A consumer who is not affiliated with the cosmetology, barber, esthetician or manicurist industry? Be an active voice for the cosmetology industry. If you are interested, please submit your application to the board today. Application with instructions on how to apply can be found online at http://www.dol.wa.gov/business/cosmetology/docs/630057cos.pdf. 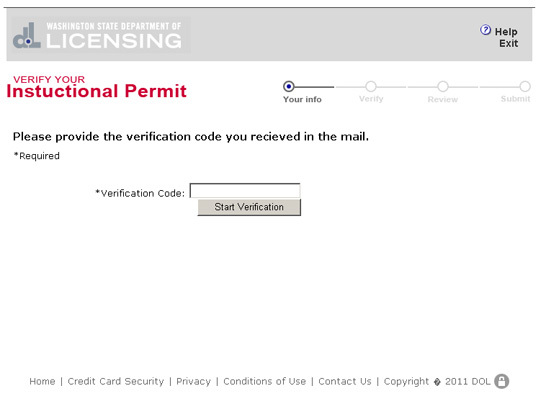 The Department of Licensing warns Washington residents to be vigilant about protecting themselves from potential phishing schemes involving driver licenses, ID cards and instruction permits. Phishing involves tricking individuals, usually using computers, into volunteering personal information about themselves that can be used for fraud like identity theft. Recently, a letter was sent to an individual in Clark County who applied for an instruction permit. It said he had been selected for additional verification and that in order to receive his permit he needed to go to a website and answer some security questions. The website was similar in appearance to DOL’s website, but is not associated with the department. 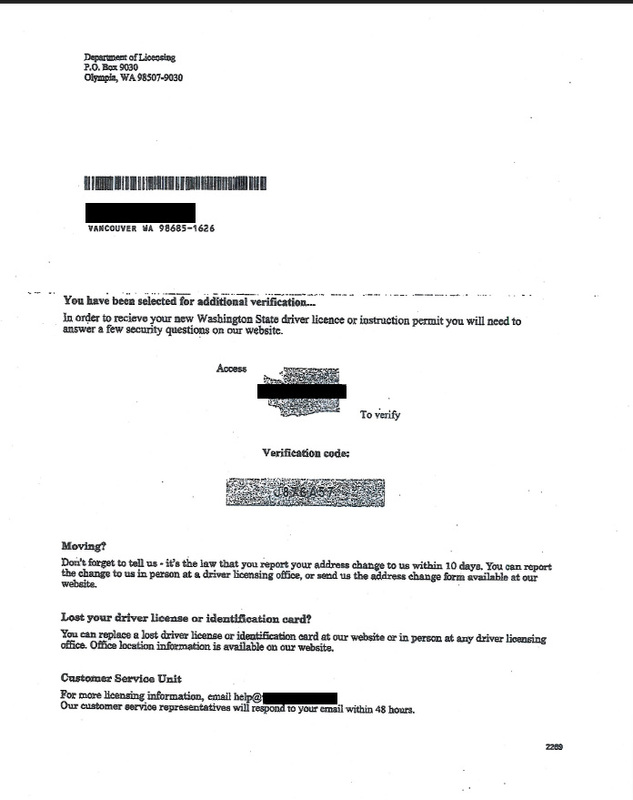 He was asked to enter a verification code provided in the letter, and a counterfeit page asked for personal information like Social Security numbers and driver license numbers of his parents. The letter also directed customers to contact customer service representatives at an email not associated with the department. DOL is currently investigating this reported fraud and is taking steps to have the fraudulent website shut down. At this point, an analysis of the fraudulent website appears to indicate this is an isolated incident limited to one victim. However, we urge customers to contact us right away if they received a letter that directed them to a website to verify personal information. You can email the department at fraud@dol.wa.gov or call us at 360-902-3915. When the Department of Licensing produced a video about a 19-year-old Thurston County woman killed in a distracted driving crash, many of you took notice. Now, the nation’s top transportation official has noticed, too. This week, US Secretary of Transportation Ray LaHood added our video about Heather Lerch to the US DOT’s Faces of Distraction website. 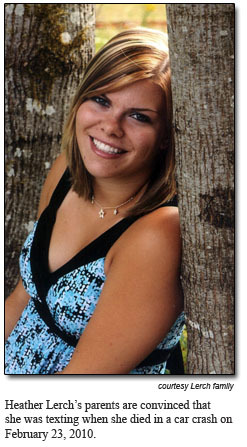 Lerch died instantly after her car left the road on February 23, 2010. Only a few weeks after their daughter’s death, Dan and Wendy Lerch shared their story with us on-camera, hoping to convince others not to text and drive. They said that they have no doubt that Heather had been texting behind the wheel when she crashed. Since the DOL first published the video on its YouTube channel in April of 2010, Heather’s mangled car has been on display at many public places, to include several high schools. The DOL produced two versions of Heather’s story; a 30-second Public Service Announcement, and a longer video that runs about five-and-a-half minutes. The US DOT is showcasing the longer video. Last year, the DOL and State Patrol also featured Heather’s story in their efforts to inform the public about a new state law that makes the illegal use of a cell phone while driving a primary offense. You are currently browsing the Licensing Express blog archives for July, 2011.